When fire burns across a pasture it blackens the earth but with any added moisture there are soon green shoots of grass in its place, even if the remainder is still brown. So it is with my life and it seems as if I burned myself down just to replenish the richness of my spirit. I have done this repeatedly if unintentionally but having reduced myself to bare ashes of late, so I have begun to rejuvenate also. There was a visit with old friend and a long conversation to remind me of all the wonders just out of my reach and perhaps as with the pastures I also needed the deluge of this most recent storm to refresh my spirit. Add to that a day off and then a few hours of respite today before I returned to work and I am all but restored. My life has been a joyful experience for the most part and there is truly no reason for it to be anything less, even if I forget that at times! What is it that allows even the strongest of us to get distracted at times? Necessity seems to rule over our lives and if we are committed to our self-imposed responsibilities we can force ourselves to undertake things we would otherwise avoid. In my case there is also the added factor of substitution, of seeking a remedy for the things I lack in other pursuits, even if they be less than I really want. I have failed at this before, so I have failed again, burning myself down in the process. So I rise from the ashes also, dusting myself off even as the latest storm has cleansed the earth and I will grow from this moment on. 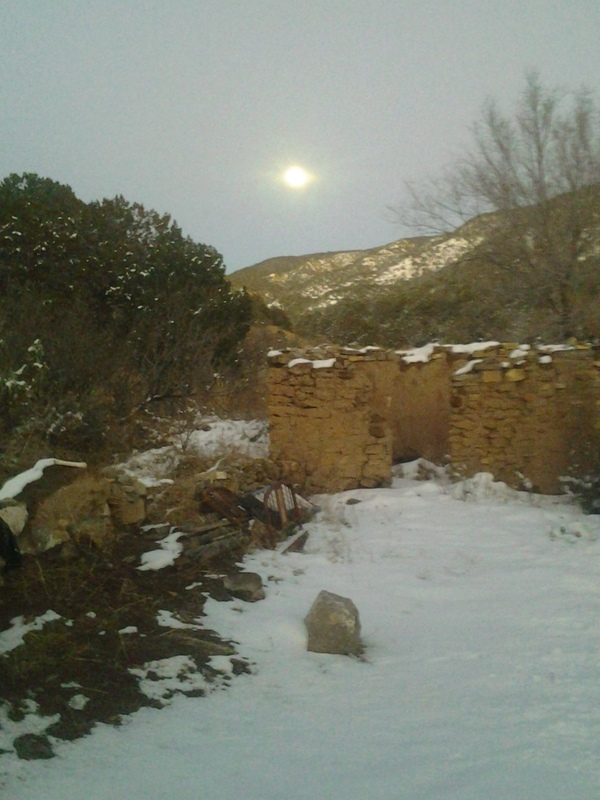 Not so long ago the moon rose over the foundation of the ancient adobe house which sits so close to my own small dwelling. I say ancient but the woman I pay my rent to used to live in that room and others I know once played there also. They recall those days clearly and it puts a perspective on my life and theirs which might otherwise be lost. Theirs was a simple life in which there was a great appreciation for every aspect of their survival, as mine is also. When I perused my dwelling this morning, nothing more than a renovated school bus, I came away with an added appreciation for the warmth I have found therein. It was 11 degrees last night but only a fraction of the chill touched my life as I kept a good fire going through the night. So it would have been in that adobe room and they would have slept close to each other also. The value of such simple things can be so easily lost when we fail to reflect on them and in our rush for bigger and better things we so often lose that perspective. I was so glad to be reminded of that! Even as I so recently burned myself down, plunging my spirit into my frustration and discouragement so I waken to a new perspective with the ground covered with fresh fallen snow and my spirit renewed by my musings. My future is my own to decide on and at no time have I ceased to move forward, I simply sent myself adrift by failing to be mindful of myself. I have often questioned why it is so easy to be taken away by the negative things and how easy it is to dwell on them while the positives stand patiently in waiting. Why can’t we keep our eyes focused on the light rather than letting the darkness shadow our thoughts? Certainly we are influenced by outside sources as well, the turning of the earth and the pull of the planets weighing in on our moods but we still have free will also. I may be empowered by the rich fullness of the moon but I have my own resources as well and I need to remember to draw on those in my time of need, it is the very reason I have honed those strengths. The sky twinkles with clear blue and cold today and the sun reflects off of every frozen crystal of ice and snow which lies upon the earth. I might have been cold last night but I was not and I have so much that I can be grateful for, a year ago I might have frozen! Snow capped that old adobe wall and the snow crunched beneath my feet but the tender shoots of the weeds remained green through the storm. I woke refreshed and found a bed of hot coals still glowing in my wood stove, its warmth still holding back the chill of the dawn. I added a few slivers of wood and it soon burst back to flames, life is good. It is those subtle reminders which fire my spirit and restore the balance that has too often eluded me of late. I need to remember that and as the ashes replenish the fire scorched earth so I need to grow again also! I am off to a good start. Just remember the phoenix bird arises from the ashes of the fire. To me this represents the rebirth of ones soul. I think that this happens many times in our life and for some the times are too numerous to keep track of or count. Keep up the good work that you are providing yourself. What comes to mind is the old saying “It is a good day to die” and what is left unsaid “It is also a great day to live”. Your comment is greatly appreciated as is the associated wisdom. Thank you for the affirmation, I am moving forward every day and shaking off the ashes as I go!